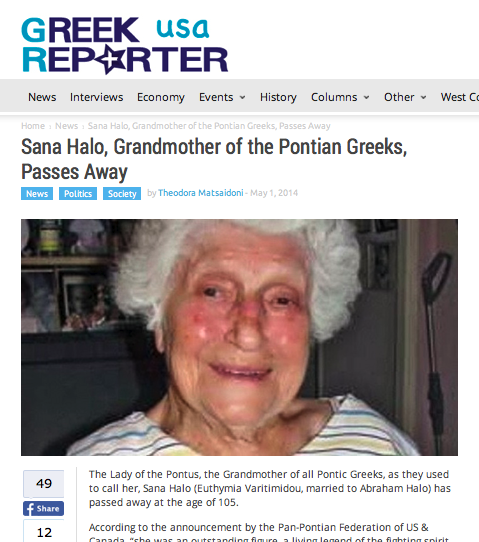 The Lady of the Pontus, the Grandmother of all Pontic Greeks, as they used to call her, Sana Halo (Euthymia Vartimidou, married to Abraham Halo) has passed away at the age of 105. . . . .
Sana Halo showed the whole world the major national issue of the genocide of the Greeks in Pontus and Asia Minor and that of the Christian nations in the falling Ottoman Empire as well, through her personal testimony of her individual suffering in her homeland, Pontus, 90 years ago. Her words were written down by her daughter Thea Halo in the book Not Even My Name. The book is a story of her march from Pontus to Lebanon when she was ten years old, during which journey all her family members died, and details her efforts seventy years later to learn about her national identity and her family name with only vague childhood memories to go on. . . . .